Sgt Samuel G. Athey, Jr.
Howard Hawthorne, Navigator contacted us with updated information about his crew. This is very exciting as he is the only contact for this crew and another 39ther that has been found - or in this case found us (the 39th BG Assoc). Updates: Added Missions, corrected rank, and positions; it has been determined from Hawthorne's Record of Combat Duty that the "Buckley Crew" was Crew 52 - making them the replacement crew for Paquette's Crew. Per General Order 29 dated 11 August 1945, all of the crew except for Haag and Minor were awarded the Air Medal from 7 July to 24 July 1945 - note: Haag and Minor may have awarded the Air Medal under another order not obtained yet. Thanks to the Athey Family for providing the above mentioned order. 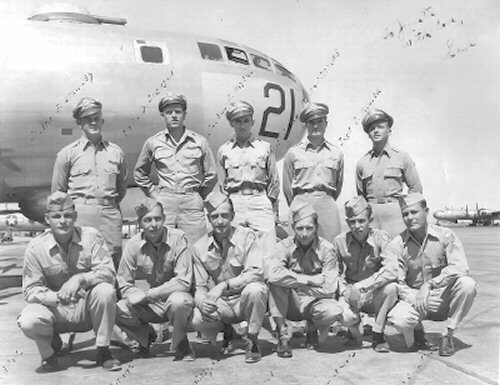 David Athey, son of Samuel G. Athey, Jr. RG, contacted our site regarding his father and this crew. He related that the Buckley Crew returned to California in preparation for lead crew training and during that time the ABomb was dropped - thus they never returned to Guam... more information to follow.